The University of Washington has joined NextFlex, a consortium of 30 academic institutions and industrial partners to develop the next generation of flexible electronic devices. As a founding member of this alliance, the UW will seek local and regional partners in the electronics and manufacturing industries to develop and produce flexible electronics for applications from medicine to transportation. 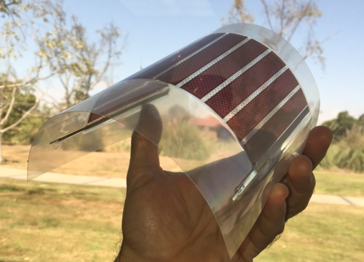 Flexible electronics are inherently thin and designed to be bent, rolled, folded or incorporated into new technologies or products in ways that traditional rigid electronics cannot. J. Devin MacKenzie, a Washington Research Foundation Professor of Clean Energy who holds appointments in the Department of Materials Science & Engineering, the Department of Mechanical Engineering and the UW Clean Energy Institute, joined the UW in September 2015 to create new methods to produce printable and flexible electronics and energy devices for large-scale industrial applications. Flexibility and durability are key characteristics that would open up new applications ranging from medical devices to industrial sensors. But developing scalable, cost-effective, sustainable methods to synthesize these devices is a major hurdle preventing large-scale implementation. That is where NextFlex funding and resources can play an important role, MacKenzie said. Launched earlier this year, NextFlex has received $75 million in federal funding through the U.S. Air Force Research Laboratory. From its headquarters in San Jose, California, the center will accept proposals from participating universities to form collaborations with private companies to develop advanced manufacturing processes and integrated systems paralleling the UW team’s goal of printed flexible electronics. Regardless of each participant’s focus, NextFlex’s goal, according to MacKenzie, is to fund endeavors that are close to real-world application: to bring flexible electronics into real-world applications as soon as possible. MacKenzie helped secure funding for the NextFlex center before joining the UW faculty, when he was with Imprint Energy, a California startup developing flexible high-energy batteries. UW researchers can now team up to apply for NextFlex grants to pursue projects in flexible electronics with local and regional industrial partners. As well as making use of NextFlex’s Silicon Valley infrastructure and funding, the UW and its industry partners could combine funds, personnel, time, materials and facilities, including those under development, like the Washington Clean Energy Test Bed facility expected to launch at the UW in early 2017. For more information, contact MacKenzie at jdmacken@uw.edu.